Professor Alfred E. Moore, (1858-1890), was an early Connecticut aeronaut from the town of Winsted, who was perhaps best known for his balloon ascensions with photographer John G. Doughty, (1857-1910), during which some of earliest aerial photographs of the Nutmeg State were taken. Professor Moore’s first balloon ascension took place at the former Cherry Park in the town of Avon, Connecticut, on July 4, 1885. On the evening of July 29th, 1885, Professor Moore and another well known Connecticut aeronaut, Silas M. Brooks, (1824-1906), made a balloon ascension from Winsted, Connecticut, in a balloon named “Winsted” after the town. This was Moore’s second balloon flight. The Winsted was reported to be “the largest balloon now in existence”, measuring 80 feet height and 120 feet around, with a gas capacity of 30,000 cubic feet, and capable of lifting 15,000 pounds. Unfortunately, this flight ended badly when the balloon encountered a severe storm. The following excerpt is from a newspaper article which appeared in the Alexandria Gazette, (Virginia), on August 4, 1885, detailing the ill fated flight. History has shown that Silas Brooks survived his ordeal and lived for another 21 years. About a month after that perilous flight, Professor Moore made his third balloon ascension on September 3, taking with him as a passenger photographer John Doughty. The following article appeared in the Morning Journal And Courier of New Haven, Connecticut, on September 4, 1885. It relates the details of that third flight, and also mentions the ill fated flight of July 29th. Southington, Sept. 3. – Look! Oh, Look! See that big thing up there. Oh! Charlie, why what is it? Don’t you know? Why it is a balloon. Such were the remarks overheard by the Courier correspondent last evening as Prof. Moore with his balloon passed over this town as briefly noted in the Courier yesterday. For about twenty minutes hundreds of people kept their eyes heavenward awaiting with no little anxiety to see where and when the thing would drop. About 6:20 the balloon made a descent and was lost from the sight of our townspeople. Numerous were the queries as to where the balloon had landed, but about 8 o’clock they were all dispelled by the news of the arrival of J. C. Messenger and the two aeronauts, Alfred E. Moore and John G. Doughty. 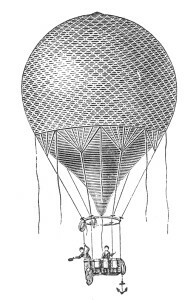 After they had partaken of a lunch they were found at the Bradley House by your correspondent and the following was gleaned from the highflyers: “We left Winsted at 5 o’clock with our balloon and apparatus and made the ascent very rapidly. The balloon was inflated near the gas works, from which spot we made our start. Several persons tried to prevail on us to wait until Thursday, but we made up our minds that procrastination was the thief of time, so we did not calculate on being robbed. As soon as the ropes were cut we started on our journey and when about one thousand feet above Winsted we photographed the spectators and from (the) time we landed in Kensington on the farm of E. J. Whitehead we took twenty views of the different towns, lakes, groves, and mountains over which we traveled. We made the distance of forty miles in one hour and twenty minutes. The balloon when inflated stands forty feet high and is seventy-two feet in diameter, and weighs, with the basket, 500 pounds, and has a capacity of 30,000 cubic feet for the reception of gas. The gas used in ascension was common illuminating gas. The occupants of the basket at the time of making the ascension were myself, Alfred E. Moore, and Mr. John C. Doughty, son of the leading photographer, and a carrier pigeon, which we let loose when over Bristol.” Mr. Moore further stated that this was his third ascension and that the balloon, which is his property, is the second one he ever saw, the first being the Fourth of July last, when he made an ascension from Cherry Park alone and traveled nineteen miles in sixteen minutes. On the 29th of the same month he, in company with Professor Silas M. Brooks, who has made 166 ascensions in his life, made an ascent from Winsted and came very near being killed by the balloon being torn open. Professor Brooks had his body blackened in a horrible manner. Mr. Moore says that the beauty of riding in a balloon is that your course is all the at “double tracked; no danger of a collision up there.” The balloon was carted to the depot this morning by a man named Carey and was the object of much curiosity. On October 1, 1886, Professor Moore experienced another aeronautical adventure in a balloon. On that date he ascended from Bristol, Connecticut, and when the balloon had risen to about 8,000 feet it was caught in a strong northeast wind current which carried it towards Hartford at a rapid rate. While passing over the city Moore began jettisoning ballast, which caused the balloon to suddenly plunge downwards where it came down in some trees on Birch Mountain in Manchester, Connecticut. Local farmers had to cut down four trees to rescue Moore from his badly wrecked balloon. Moore had traveled a distance of 35 miles from his starting point in only 25 minutes, giving him an estimated speed of 84 mile per hour. Professor Alfred Moore died July 15, 1890. The following announcement appeared in the Evening Star, (A Washington, D.C. newspaper) on July 16, 1890. Alfred E. Moore, president of the franklin Moore Bolt Company at West Winsted, Conn., died yesterday of Bright’s disease. He was prominently known in the iron trade of the country and had achieved a wide reputation as an aeronaut, having made a number of ascensions. One of his most notable ascensions was made June 17, 1887, from Sportsman’s Park, St. Louis. The monster balloon which Moore had built at his Connecticut home for this particular ascension, at the expense of a newspaper , had been waiting a week for favorable air currents. The voyagers were Mr. Moore, in charge of the expedition; H. Allen Hazen of Washington, connected with the United States Signal Service, and Prof. John G. Doughty, photographer. The highest point reached was 16,000 feet, greatest altitude, probably, ever reached by a balloon in this country. A premature descent was made near Centralia, Ill., 55 miles northeast from St. louis, the balloon having become nearly unmanageable. The landing was very difficult and dangerous. The event was eminently successful from a scientific point of view, according to Prof. Hazen’s report. It was the intention of the projectors that the balloon should land somewhere on the Atlantic coast, thus proving the existence of an easterly air current, but the failure to work satisfactorily prevented this. Alfred E. Moore is buried in Forest View Cemetery in Winsted, Ct.
September 9, 1886: Moore ascended from the fair grounds at New Milford, Connecticut, and landed about one hour later in Merwinsville. September 22, 1886: Moore ascended from the fair grounds in Watertown, Connecticut, and landed 18 miles away on the farm of E. C. Stillman in Meriden, Conn.
September 30, 1886: Moore ascended in his new balloon, “The Comet”, from the Southington Driving Park. This was reportedly The Comet’s first flight.